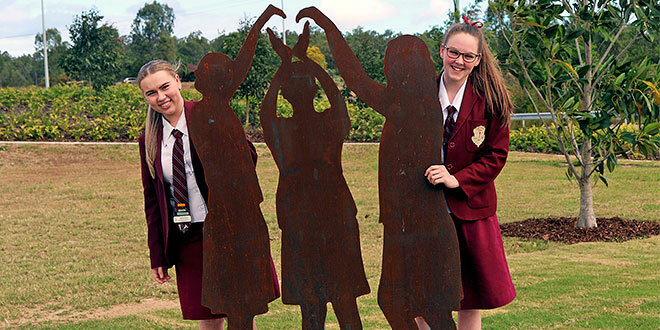 Festival art: St Mary’s students Ashleigh Devin and Zoe Anlezark at the unveiling of life-size steel silhouettes during Ripley Town Centre’s Main Street Festival. ARTWORK by students at St Mary’s College, Ipswich, took centre stage at the official opening of stage one of Ripley Town Centre. During the Main Street Festival to mark the town centre opening the students’ art, which was transformed by ColourChiefs creative workshop in Brisbane into life-size steel silhouettes, was unveiled. Eight St Mary’s students had their names engraved on the artwork, with acknowledgement they were from the college. In January, the college was invited to take part in a competition for which they submitted photographs that used student bodies to portray unity, love and happiness. The students loved the process and enjoyed coming up with unique ways of expressing emotion with body language. The college’s entry won, and they received a $500 prize, as well as the legacy of having three steel artworks permanently fixed in the town centre. Before the official unveiling, the artists were given an opportunity to see first-hand how their photos had been converted to silhouettes. They also witnessed the artistic license it took to make them look natural as a silhouette. Accompanied by principal Judith Finan, 10 students arrived at ColourChiefs to witness the conversion. ColourChief director Angus Ross said it was a unique way for the students to experience a form of graphic art design. Ms Finan said the students found the visit informative and rewarding. “We were delighted to experience a personal tour of ColourChiefs, who were consulted by Sekisui House to build the life-sized artwork,” she said. Ripley Town Centre development manager Taku Hashimoto said many schools were involved in the community initiative. “It was great to give students from St Mary’s the opportunity to be a part of the behind-the-scenes process,” Mr Hashimoto said. Mr Hashimoto said the artwork was designed to pay tribute to the energy of youth that would become an enduring symbol of the Ripley region as it continued to come of age.